Jan: Went Bangkok for a trip with my wife, but not with son. Left him with my mum back in Singapore, and happily so! We’re so tired and we need to take care of ourselves. Looking back, we’re so…noob being parents, haha! Perhaps the new year 2019 will see me bringing him along. Already done up his passport. Feb: Looking back, I realised I was too reliant on my mum to take care of the baby. When she wasn’t around, I was complaining how hard it was to manage the whole day. These days, I can take care of everything and more, alone, with nary a complain. I’ve improved a lot over the months. Mar: Met up with a bunch of bloggers at Canton Paradise. Some of them I met only once a year, so it’s great to catch up with them. Apr: My son fell sick, and all hell broke loose. As mentioned, I’m not a very good parent. Not skillful enough at doing the task and also just generally tired. There are so many posts talking about how tired I am taking care of the kid. Too many. Oh, and my son started walking in 4-5 steps. Milestone achieved. May: Mum had a fall while crossing the road, and fractured her wrist. Had to send her to the nearest emergency department. Could have been worse. Looking back, I think this is the catalyst that made us truly take care the care of our son from my mum. Without her fall, we could still be relying on her and not learning the care-taking part fast enough. It’s true – everything that happens, happens for the best. My son also fell sick, a major one. Jun: My air conditioner is spoilt. In bloody hot june. In the end I had to change the compressor. My son started to develop a mind of his own and insist on doing things his own way. Can’t control him against his will (as easily) as before now. I see that as a good sign, not a bad one. I’m also starting to act like the disciplinarian of the family, which is quite startling to me. I thought my wife is the one. And we had discussed about it before! We all got a plan until we got punched in the face. Also met up with another group of Investingnote friends (let’s call it that) at Singpost center. July: After eating some prawns, I had rashes all over me. Thankfully it subsided and no further action required. Started learning python programming by reading the text myself. Brought my son out to the airport – the first time ever. It was such a pleasant experience that we ended up going there almost every week. If you see a couple chasing after a cute botak kid, that’s likely me. Oh, and I went there today too. Son called me ‘papa’. Not the first time, but the clearest I’ve ever heard from him. My heart melted at that instant. Started test driving my current car too. COE must have dropped enough to make me test drive new cars. Aug: Son had diarrhea while we’re out going to the doc for his vaccination. On a day that I decided not to bring any diapers because it had been fine all along and it’s a short trip. I learnt my lesson very well. I ALWAYS bring along diapers now. Bought a new laptop for my wife. Son started climbing flights of stairs on his own. Back then, he was managed maybe 1 floor. Now, he is doing 3 floors of stairs, and doing it repeatedly up and down for 6 to 8 times. That is progress. Sept: Went ahead and booked a new car. Met up with my long-lost primary school friends. Even my teacher is there. The entire block of my HDB flat had a blackout, which lasted for a few hours. Sold my old car to a dealer. A bit sad to see it go, but I knew it was a right choice. Oct: Collected the new car. The smell of a new car is …over-rated. Started going to the library more often as my work starts winding down. I’m still trying to hit my 30 books a year target. Majority of work is done. Nov: Went omakase dinner at Teppei sushi. Wasn’t up to my expectations though. Been going out a lot with my son. I realised I’m very proficient at taking care of him now. Going to send my kid to a childcare centre in 2019. Dec: Met up with a group of friends for steamboat dinner. Had a lot of fun, though most of them are strangers. Had a very quiet Christmas and a very quiet new year’s eve. Just the way I like it. I also deleted facebook and messenger app from my handphone. No more of it. If not for the diary, I would have forgotten most of these stuff. Looking back the year by browsing through all the daily entries is really a very good exercise to be grateful for what had happened and also to have faith that whatever is happening now, is happening for the best. Since I’m a self employed, I also noted that my working hours had reduced by about 12%, leading to a corresponding drop in income by about 12% too. I don’t really care about that as long as my savings goals are reached (it is). The time that I didn’t spend working, I spend it all on my family. I think with the new responsibility as an involved daddy, it’s inevitable that I will reduce my working hours. I had to. There’s always a cost to everything, of course, but I think as long as my savings goals are achieved, anything more is just a bonus. I’m okay with the reduced working hours and income. 2019 might be a better year for me, as my order book had been more or less filled up to a comfortable level. We shall see. My investment portfolio had a time-weighted return of -7.7%, doing worse than STI’s -6.6%. XIRR for 2018 is -8.4%. It’s auto calculated from stocks cafe. I think it’s actually worse than that, because stockscafe didn’t include the suspended Hyflux perps that I had. In my own spreadsheet I had already treated it as totally gone. So be it. 2018 is a tough year for most people, and I know I’m not one of those investment greats with double digits gains, lol! My strength is not in investment, but in my active income and savings. And I’m very sure I’ll still achieve some sort of financial freedom in 10-15 yrs time. That’s comfort enough for me. I’m not dying to hang up tutor’s boots anytime soon. And just as I’m very well trained in my current parental role, the new year 2019 brings along new challenges as I’m going to send him to a child-care center. Starting half day first but planning to put him for longer hours. I heard the first few months will be enduring illness and also the heart breaking of leaving a child in a strange place. I’m a bit apprehensive, but I’m sure by the end of 2019, I’ll be looking back in hindsight and seeing that as a wonderful decision. 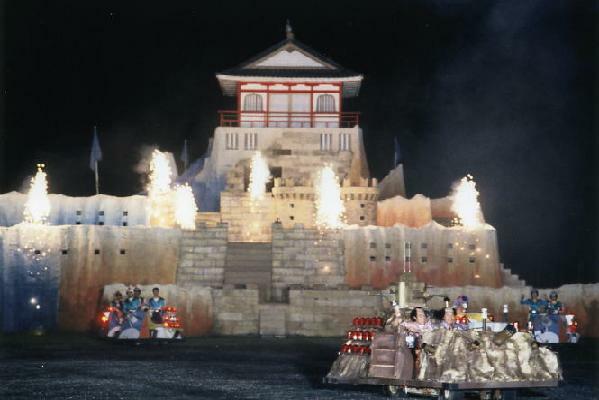 Attack of Takashi castle – SUCCESS! Wishing everyone great health, great relationship and great wealth in the coming new year 2019!